This post by Caroline Bologna was written for and originally published on HuffPost and can be viewed here in it's entirety. As the founder of the “Normalize Breastfeeding” project, photographer Vanessa Simmons has captured and shared countless images of mothers nursing their babies around the world. 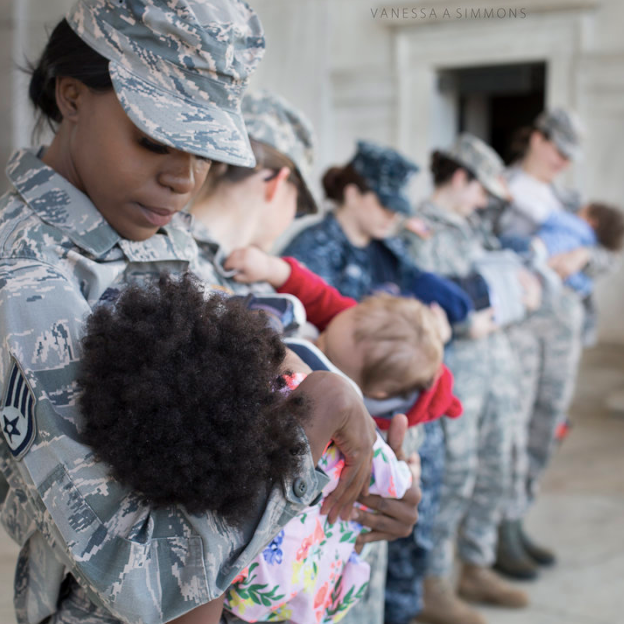 While photographing mothers in the Washington, D.C. area as part of her Normalize Breastfeeding Tour, Simmons documented a group of breastfeeding women in their Army, Navy and Air Force uniforms. Some of the moms in this series found Simmons through friends on social media, and others joined through her partnership with Breastfeeding in Combat Boots — a nonprofit that advocates for military mothers working to nurse while serving their country. “I have learned that many active duty moms are struggling to find support to continue nursing and pumping once they return to work full-time,” Simmons told The Huffington Post. The photographer first took pictures of an active duty mom breastfeeding in uniform in March 2015, but when she shared an image from the session on Facebook, she was disappointed to see the comments section flooded with hateful, misogynistic responses. With this series, Simmons wants viewers to see the beauty and power in military moms breastfeeding. “I hope that others recognize the difficulty at hand for every mother to breastfeed their baby, yet I also hope that they see the strength of the women who serve our country while serving their families simultaneously,” she said. “I am inspired by their stories, I am impressed by their bravery in the midst of mothering, and I am grateful to have the opportunity to share the images that I have captured,” she added. To learn more about the #NormalizeBfing project and tour, visit Simmons’ website, NormalizeBreastfeeding.org. And keep scrolling for more photos of military moms nursing in uniform, along with snippets from the photographer’s interviews with them.